Simplicity is a great foundation and powerful foil to unnecessary complexity. 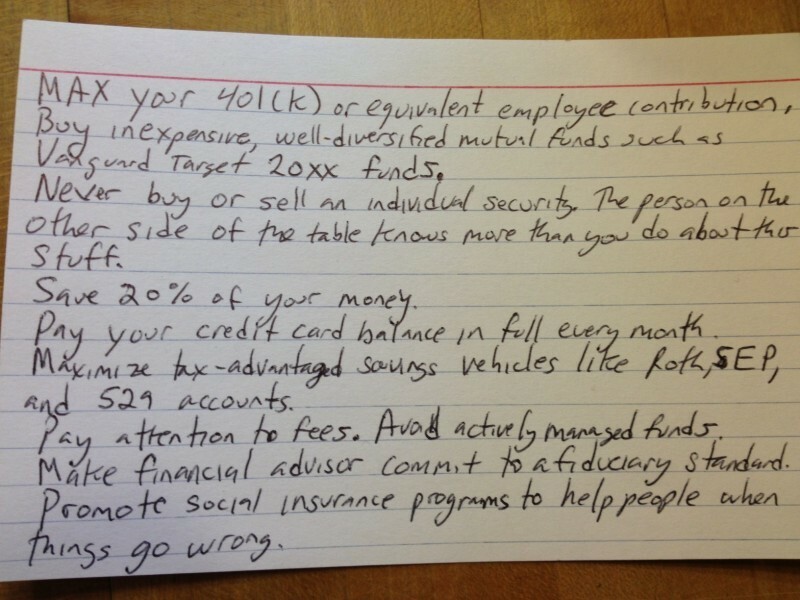 University of Chicago professor Harold Pollack champions this approach to personal finance and dashed out this index card to make his point. We work with our clients to go above and beyond the common sense, but it’s built upon a strong foundation of essentials similar to Dr. Pollack’s. But despite perception, double-digit declines from prior highs are the norm, not an anomaly. It happens two out of every three years. The average intra-year decline is 16.4%. This current decline might feels worse due to the speed at which it’s happening, and because it’s occurring right out of the gate. Double digit declines are to be expected, 64% of all years experienced them. It’s not unusual for those double digit declines to be of little importance. 57% of the years with 10% drawdowns finished positive. Stated differently, 36% of all years saw a double digit decline and still finished positive. Drawdowns of 20% or more have happened 23 times, or 26% of all years. On five of those 23 occasions, stocks still ended up positive on the year. 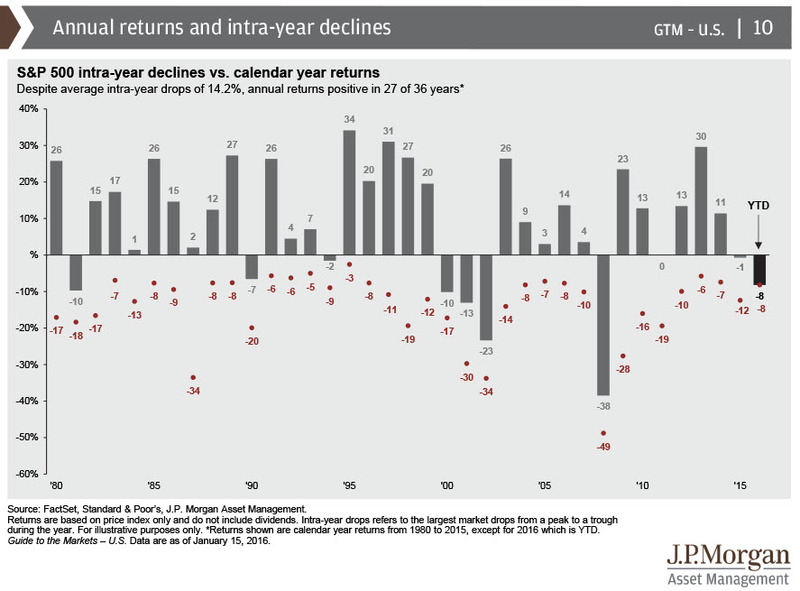 The following chart provides a great visual on how intra-year drawdowns are normal. Stock Market’s Down — SO WHAT? Chances are, your portfolio is a diverse mix of investments. While stocks may be falling, you probably also have some bonds and cash. Perhaps there are some real estate mutual funds, too. Then there’s your home equity if you own a home, not to mention the value of your future earnings. These things probably won’t all fall simultaneously. If you were in stocks from 2009 to 2015, or in the 1990s or consistently since the early 1980s, you are most likely a big winner. It’s generally a bad idea to look at your investment statements too often, but take a quick peek at your long-term performance. That outsize gain you see is one reason you were in stocks in the first place. At some time in the past, when you were not scared, you made a decision to construct your portfolio a certain way. You knew that stocks involved risk and that the returns they have traditionally delivered, above and beyond what cash and bonds do, was the reward for your persistence. 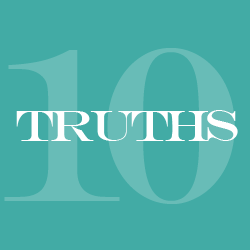 Too many 70-year-olds sold all of their stocks in 2009 and are healthy enough to live to 100. They would be going on a lot more vacations now and be worrying less about long-term care if they had held firm. Maybe you are one of them. But try to give this more time, and consider the alternatives. There are few investments that can deliver the kinds of returns that stocks can without their own accompanying anxiety. An alternative is to save a lot more in safer investments like cash or certain bonds. Most people don’t have enough income to do that easily, so settling for lower returns will mean a combination of working longer and living modestly. For some people, that is a fine trade-off. There is absolutely nothing abnormal about what is going on here. Most of us have to save somewhere, and history suggests that stocks are the most accessible route to getting the returns you will need to retire someday. It would take decades of systemic economic erosion to prove otherwise, and a few days of market declines do not suggest that anything like that is upon us. Read more at the NYT and stay cool! 1. They happen. Sometimes stocks go down. That’s why they’re called risk assets. Half of all years since 1950 have seen a double-digit correction in stocks. Get used to it. 2. They’re a natural outcome of a complex system run by emotions and divergent opinions. Humans tend to take things too far, so losses are inevitable. 3. Everyone says they’re healthy until they actually happen. Then they’re scary and investors who were looking for a better entry point begin to panic. 4. The majority of the people who have been scaring investors by predicting a bear market every single month for the past seven years will be the last ones to put their money to work when one actually hits. 5. It’s an arbitrary number. I have no idea why everyone decided that a 20% loss constitutes a bear market. The media will pay a lot of attention to this definition while it doesn’t matter at all to investors. The 1990s saw zero 20% corrections but two 19% drawdowns. Stocks also lost 19% in 2011. Does that extra 1% really matter? 6. Buy and hold feels great during a long bull market. It only works as a strategy if you continue to buy and hold when stocks fall. Both are much easier to do when stocks rise. 7. Your favorite pundit isn’t going to be able to help you make it through the next one. Perspective and context can help, but there’s nothing that can prepare an investor for the gut-punch you feel when seeing a chunk of your portfolio fall in value. 8. 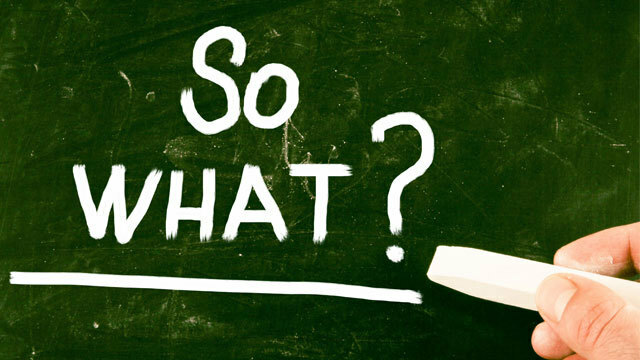 History is a broad outline of what can happen in the markets, not what will happen. Every cycle is different. 9. They’re very difficult to predict. All of the valuations, fundamentals, technicals and sentiment data in the world won’t help you predict when or why investors decide it’s time to panic. 10. These are the times that successful investors separate themselves from the pack. Most investors mistakenly assume that you make all of your money during bull markets. The reason so many investors fail is because they make poor decisions when markets fall.